Lighting: Tips to Illuminate Your Home! If you’re at all like me, lighting seems to be one of the most difficult tasks! I recently spent 2 months trying to find the perfect light to hang above my kitchen table. There are so many designs and I got myself lost in a sea of concepts during the decision process!! In all seriousness, this post is meant to give you some helpful advice for your lighting plan dilemmas for almost every room in your home! Brought to you by Decor-Rest. 1. If you are picking out a lamp for your bedroom nightstand that you would be using for reading – make sure the bottom of the lamp shade runs even with your shoulder when you are sitting up in bed. Also consider a tri-light lamp that allows you to adjust the level of your lighting from soft to bright! 2. Looking for a lamp for your living room end table? Make sure the bottom of the shade is at eye level when you are sitting down – approximately 40 to 42″ from the floor. If the lamp is higher than this, you will be able to see under the shade and have a glare from the bulb. 3. 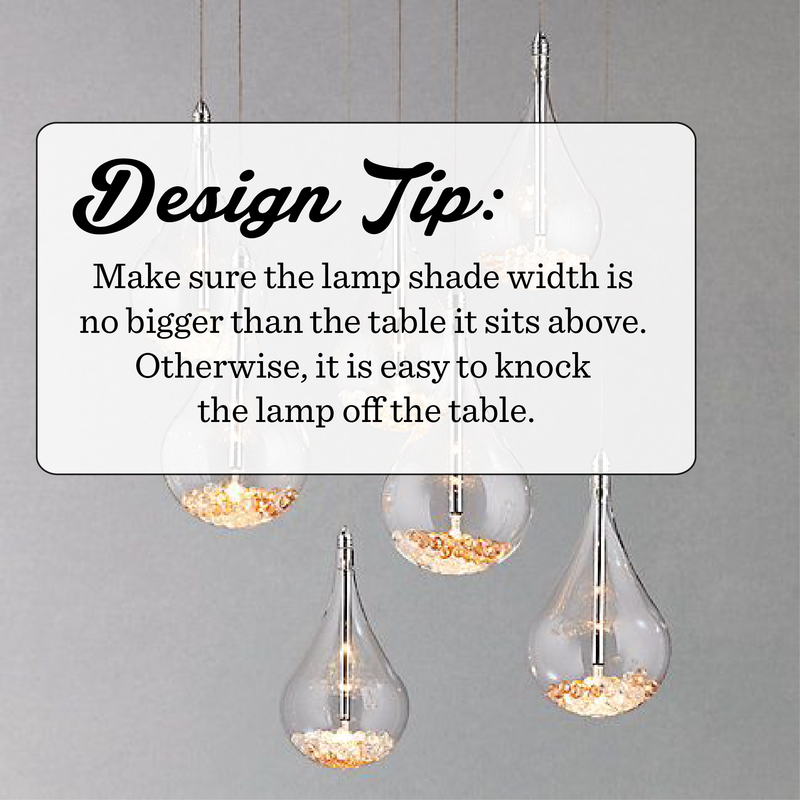 If you are looking for lighting for your desk or home office, the lamp or shade should also be at eye level. 4. A Torchier style floor lamp (pictured below) provides soft, ambient lighting to a room. It offers a soft glow to the center and upper portion of your space. This is good for a family room where you might watch TV or anywhere where you would not want to have significantly bright light. 5. When you are making a general lighting plan for installing recessed, low voltage halogen lights – it is best to place the pots 5′ to 6′ apart (in width and length). If the lights are too close together, the ceiling will look too cluttered and uneven. 6. When installing bathroom or fireplace wall sconces, the light boxes should be installed 5′ – 6′ above the ground level. 7. The most flattering type of light in bathrooms occurs when lights are installed above or on either side of a mirror. Avoid adding lights directly above your head if there is a mirror in front of you. This type of light creates shadows on your face and below your eyes. 8. Because lighting intensity affects the mood and look of a room, always consider adding dimmers to your lighting plan. Dimmers not only add ambiance to a room, they are also very cost effective. They are especially useful in the dining area where you require various levels of lighting for different occasions. I hope that these tips will help you with your next lighting endeavor! Be sure to check out our lighting selection at Sheelys.com or check out our Pinterest Boards for some more inspiration! This entry was posted in Lamps, Lighting, Lighting Tips and tagged Floor Lamps, Lamps, Lighting, Lighting Tips, Table Lamps by sheelysfurniture. Bookmark the permalink.